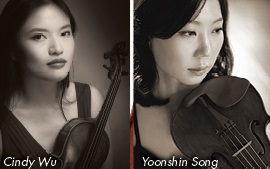 Violinists Cindy Wu and Yoonshin Song first played together before they were in elementary school. They have each gone on to sensational careers. The will be reunited in a Vignette hosted by Terry & Seth Lloyd in the intimate living room of their Grosse Pointe Park home.